Can we manage sport related concussion in children the same as in adults? Consensus guidelines for managing sport related concussion in adults have been increasingly widely implemented.1 So far, there are no guidelines that enable clinicians to manage similar sporting concussive injuries in children. Furthermore, there are a number of important anatomical, physiological, and behavioural differences between adults and children that suggest that adult guidelines will need to be either modified or rewritten to manage injuries in this age group. In child and adolescent populations, few well controlled studies exist to identify the age specific frequency and outcome of sport related concussive injuries. It is also known that brain tolerance to biomechanical forces differs between adults and children.16 In broad terms, a two to three fold greater impact force is required to produce clinical symptoms in children compared to adults. This is due to a combination of factors, including an age dependent physiological response to mechanical stress, the differing geometry of the skull and brain, and the constitutive structural properties of the head. This means that if a child exhibits clinical symptoms after head injury, then it is reasonable to assume that they have sustained a far greater impact force compared to an adult with the same post-concussive symptoms. Over and above any cognitive effects of concussion, there is an additional issue that makes assessment difficult, namely the fact that the brain is cognitively maturing during this period. This has two major implications. Firstly, the child’s brain potentially may be more vulnerable to the impact of head injury than the more mature adult brain due to the disturbances of neuronal maturation caused by brain trauma.14 Secondly, unlike adults where cognitive function is relatively stable over time, children’s cognition continues to develop. Thus any assessment of baseline or post-injury cognitive function needs to factor in the normal maturation in cognition that is occurring over this period. Pilot unpublished cross sectional data collected in 180 healthy children using a computerised cognitive test paradigm (CogSport) indicates substantial improvement in performance between the ages of 9 and 18 years on tests of simple and choice reaction time, working memory, and new learning. The largest improvements in test performance occur between the ages of 9 and 15, with minimal changes after this age paralleling adult performance (fig 1). Mean (and standard error) response speed on four cognitive tasks in nine different age bands, from 8 to 25 years of age. These developmental changes are of comparable magnitude to post-concussive impairments observed on computerised cognitive post-injury assessment in adults.23,24 This has the potential for confusion in assessment given that maturational improvements occurring between baseline and post-concussion testing may offset any injury related cognitive impairment in concussed children and adolescents. It has also become a widely held belief that having sustained a sport related concussive injury, an athlete is then more prone to future concussive injury. The evidence for this in sport is limited with most studies being methodologically flawed.27–29 It has been suggested that individuals with more aggressive playing styles may be at the greatest risk of concussion. There is also evidence that an individual’s genetic make up may predict outcome from head injury. In particular, an association has been identified between the apolipoprotein E ε4 allele and poor clinical outcome in adult patients with mild head injury.32 Although only in the early stages of understanding, the interaction between genetic and environmental factors may be critical in the development of post-concussive phenomena. These data suggest that it may be possible to identify individuals who are at greater risk for poor outcomes from concussion and in the future management practices may need to be tailored to incorporate such information. CAN WE USE ADULT CONCUSSION RETURN TO PLAY STRATEGIES IN CHILDREN? There have been numerous attempts in the past to formulate evidence based concussion management guidelines,33 with that developed at the recent Vienna Consensus Conference1 being most widely accepted today. In broad terms, this approach recommends baseline cognitive testing to enable accurate individual assessment of recovery, in order to guide return to play following concussion. The “comparison to own baseline” model of assessment remains a powerful method of assessing change in cognitive function after concussion, and in the absence of conflicting evidence, should be adopted as a conservative approach to identifying post-concussion cognitive deficits in children as it is in adults. The central issue is how often baseline testing should be conducted. During the period of rapid cognitive maturation (8–15 years of age), baseline testing would have to be performed at least 6 monthly to enable accurate comparison for serial testing. Apart from elite junior athletes, such regular testing would be beyond the resources of most sports and individuals. For any child or adolescent athlete participating in collision sport or where there is a significant risk of concussion, annual cognitive testing should be considered. Any statistical decision about whether cognition has changed from baseline following concussion must also include an adjustment for developmental changes in cognition. This in turn requires knowledge of how performance changes on specific tests over time. 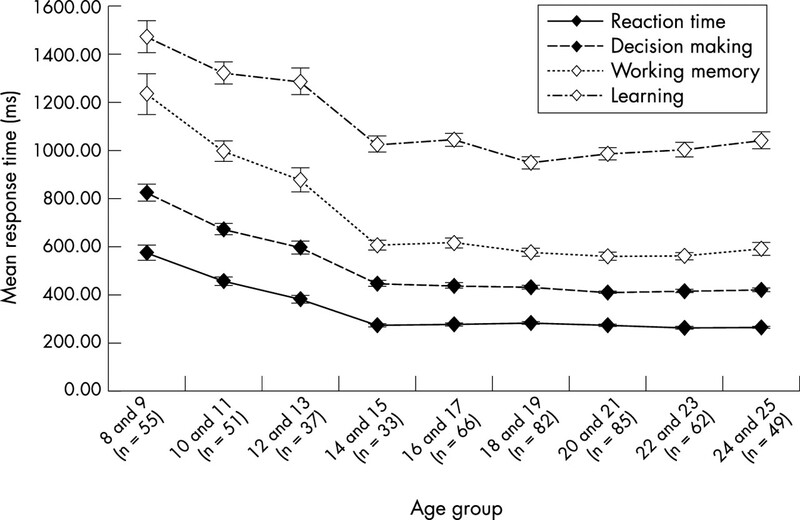 Figure 1 demonstrates the cognitive maturation process that is maximal between 8 and 15 years of age and gives an estimate of the degree of this change. Beyond 15 years of age an annual baseline test would be suitable, as for adult athletes, and be applied in the same fashion as for adults and without any developmental increment. Current adult management of concussion involves an initial diagnosis using a validated assessment tool such as the Maddocks questions36 or the Standardized Assessment of Concussion37. Neither tool has been specifically tested or validated in children with concussion. One preliminary study suggests that high school aged children (14–18 years) may also have prolonged cognitive recovery when compared with young adults (18–25 years), but that symptom recovery is equivalent between these groups.38 This finding raises the possibility that symptom ratings and cognitive testing may be differentially sensitive to concussion in minors and adults; however, there is no such information available for younger children. This in turn raises concern as to how sport related concussion assessment may be performed in these age groups and the validity of existing assessment tools. These findings support the need for prospective serial investigation of cognitive and behavioural function in healthy and concussed children and adolescents, including specific assessment of how cognitive processes (including response variability) change within individuals. Such data will be invaluable in informing the development of concussion management guidelines in this population, and the interpretation of post-concussion cognitive test data. At the present time, there are no evidence based guidelines using which sport related concussive injury in childhood and adolescence can be scientifically managed. There are significant differences between adults and children in this regard and a child who is symptomatic following head injury is likely to have sustained a far greater impact force as compared to an adult with the same post-concussive symptoms. The extent and duration of the cognitive effect on children with acute concussive injuries is variable and there may be persistent effects on scholastic performance and behaviour long after the clinical concussive symptoms and measurable neuropsychological impairment have resolved. Even subtle and transient impairments in attention and information processing skills can have a dramatic effect on the young person’s capacity to cope with school demands, with these issues being particularly critical for those at later secondary school levels. Based on pilot data, cognitive maturation is greatest in those under 15 years of age and beyond this time plateaus to an adult level of performance. Although comparison to baseline cognitive performance remains a powerful method of assessing function following a concussion injury, its application in children under 15 years of age is problematic given the rapid cognitive maturation that is occurring in this period. With regular baseline testing, an “adult” management strategy could be adopted in this age group, whereas in its absence only an estimate of normal age related cognitive function can be made. Beyond 15 years of age, it would be reasonable to follow the adult concussion management consensus guidelines utilising a “return to baseline” approach. It is suggested that concussive symptoms take longer to resolve than in adults although this may be a surrogate marker of the biomechanical differences between child and adult concussion as outlined above. It is critical therefore that concussed children and adolescents not resume sport, school, or training until all the physical symptoms fully resolve. This is important also because of the risk of diffuse cerebral swelling that may occur in children after a single head injury no matter how trivial the impact may be. The adoption of a conservative adult management strategy with a thorough assessment of symptom resolution followed by “return to baseline” cognitive function remains the most appropriate management strategy in this age group. Further research is required to characterise the duration and nature of the subclinical cognitive impairment that may exist during this recovery period in children. Increased awareness of these issues by those involved in the management of a child with concussion may assist in avoiding problems caused by this putative impairment. Aubry M , Cantu R, Dvorak J, et al. Summary and agreement statement of the first International Conference on Concussion in Sport, Vienna 2001. Br J Sports Med 2002;36:6–10. Annegers J , Hauser W, Coan S, et al. A population based study of seizures after traumatic brain injuries. N Engl J Med 1998;338:20–4. Jennett B . Epidemiology of head injury. J Neurol Neurosurg Psychiatr1996;60:362–9. Tate R , McDonald S, Lulham J. Incidence of hospital-treated traumatic brain injury in an Australian community. Aust N Z J Public Health1998;22 (4) :419–23. Alexander M . Mild traumatic brain injury. Neurology1995;45:1253–60. Wrightson P , Gronwall D. Mild head injury in New Zealand: incidence of injury and persisting symptoms. N Z Med J1998;111:99–101. Kraus JF. Epidemiological features of brain injury in children: occurrence, children at risk, causes and manner of injury, severity and outcomes. In: Broman S, Michel M, eds. Traumatic head injury in children. New York: Oxford University Press, 1995:22–39. Clapperton A , Cassell E, Wallace A. Injury to children aged 5–15 years at school. In: MUARC, ed. Hazard. Victorian Injury Surveillance and Applied Research System. Melbourne, Australia: Monash University Accident Research Centre, 2003:1–16. Yeates K , Luria J, Bartkowski H, et al. Postconcussive symptoms in children with mild closed head injuries. J Head Trauma Rehabil 1999;14:337–50. Collie A , Darby D, Maruff P. Computerised cognitive assessment of athletes with sports-related head injury. Br J Sports Med2001;35 (5) :297–302. Echemendia R , Julian L. Mild traumatic brain injury in sports: neuropsychology’s contribution to a developing field. Neuropsychol Rev2001;11 (2) :69–99. Macciocchi SN, Barth JT, Alves W, et al. Neuropsychological functioning and recovery after mild head injury in collegiate athletes. Neurosurgery 1996;39 (3) :510–4. Maddocks D , Dicker G. An objective measure of recovery from concussion in Australian rules footballers. Sport Health1989;7 (suppl) :6–7. Anderson V . Outcome from mild head injury in young children: a prospective study. J Clin Exp Neuropsychol2001;23 (6) :705–17. Ponsford J , Willmott C, Rothwell A, et al. Cognitive and behavioral outcome following mild traumatic head injury in children. J Head Trauma Rehabil 1999;14 (4) :360–72. Ommaya AK, Goldsmith W, Thibault L. Biomechanics and neuropathology of adult and paediatric head injury. Br J Neurosurg2002;16 (3) :220–42. Bruce DA, Alavi A, Bilaniuk L, et al. Diffuse cerebral swelling following head injuries in children: the syndrome of ‘malignant brain oedema’. J Neurosurg 1981;54 (2) :170–8. Bruce DA. Delayed deterioration of consciousness after trivial head injury in childhood. Br Med J1984;289:715–6. Pickles W . Acute general edema of the brain in children with head injuries. N Engl J Med1950;242:607–11. Snoek JW, Minderhoud JM, Wilmink JT. Delayed deterioration following mild head injury in children. Brain1984;107:15–36. McCrory P , Berkovic SF. Second impact syndrome. Neurology1998;50 (3) :677–84. Kors E , Terwindt G, Vermeulen F, et al. Delayed cerebral edema and fatal coma after minor head trauma: role of the CACNA1A calcium channel subunit gene and relationship with familial hemiplegic migraine. Ann Neurol 2001;49:753–60. Bleiberg J . Consistency of within-day and across-day performance after mild brain injury. Neuropsychiatry Neuropsychol Behav Neurol1997;10 (4) :247–53. Makdissi M , Collie A, Maruff P, et al. Computerised cognitive assessment of concussed Australian rules footballers. Br J Sports Med 2001;35 (5) :3543–60. Rutter M , Chadwick O, Shafgfer D. Head injury. In: Rutter M, ed. Developmental neuropsychiatry. New York: Guilford Press, 1983:77–83. Lovell M , Iverson G, Collins M, et al. Does loss of consciousness predict neuropsychological decrements after concussion? Clin J Sport Med 1999;9:193–9. Gerberich SG, Priest JD, Boen JR, et al. Concussion incidences and severity in secondary school varsity football players. Am J Public Health 1983;73 (12) :1370–5. Albright J . Head and neck injuries in college football. An eight year analysis. Am J Sports Med1985;13:147–52. Guskiewicz KM, McCrea M, Marshall SW, et al. Cumulative effects associated with recurrent concussion in collegiate football players. JAMA 2003;290 (19) :2549–55. Finch C , McIntosh A, McCrory P. What do under 15 year old schoolboy rugby union players think about protective headgear? Br J Sports Med2001;35:89–95. Finch C , Mcintosh AS, McCrory P, et al. A pilot study of the attitudes of Australian Rules footballers towards protective headgear. J Sci Med Sport 2003;6 (4) :505–11. Liberman J , Stewart W, Wesnes K, et al. Apolipoprotein E e4 and short term recovery from predominantly mild brain injury. Neurology 2002;58:1038–44. McCrory P , Johnston K, Meeuwisse W, et al. Evidence based review of sport related concussion: basic science. Clin J Sport Med 2001;11:160–6. American Academy of Pediatrics. The management of minor closed head injury in children. Pediatrics1999;104 (6) :1407–15. Davis G , McCrory P. The paediatric sport-related concussion pilot study. Br J Sports Med2004; (in press). Maddocks DL, Dicker GD, Saling MM. The assessment of orientation following concussion in athletes. Clin J Sport Med1995;5 (1) :32–5. McCrea M , Kelly J, Randolph C, et al. Standardised assessment of concussion (SAC): on site mental status evaluation of the athlete. J Head Trauma Rehabil 1998;13:27–36. Field M . Does age play a role in recovery from sports-related concussion? A comparison of high school and collegiate athletes. J Pediatr2003;142 (5) :546–53. Collie A , Maruff P, McCrory P, et al. Statistical procedures for determining the extent of cognitive change following concussion. Br J Sports Med 2004;38 (3) :273–8. Johnston K , McCrory P, Mohtadi N, et al. Evidence based review of sport-related concussion – clinical science. Clin J Sport Med 2001;11:150–60. Collie A , Maruff P, McStephen M, et al. The effects of practice on the cognitive test performance of neurologically normal individuals assessed at brief test-retest intervals. J Int Neuropsychol Soc 2003;9 (3) :419–28. Collie A , Maruff P, Makdissi M, et al. CogSport: reliability and correlation with conventional cognitive tests used in post concussion medical evaluations. Clin J Sport Med 2003;13 (1) :28–33. Teasdale G , Murray G, Anderson E. Risks of acute traumatic intracranial complications in hematoma in children and adults: implications for head injuries. Br Med J1990;300:363–7. Dacey RG Jr, Alves WM, Rimel RW, et al. Neurosurgical complications after apparently minor head injury. Assessment of risk in a series of 610 patients. J Neurosurg 1986;65 (2) :203–10. Hahn Y , McLone D. Risk factors in the outcome of children with minor head injury. Pediatr Neurosurg1993;19:135–42.